One of the most confusing aspects of dealing with fatigue is the way in which energy levels rise and fall throughout each day. Learn the underlying causes for this phenomenon, so you can better manage your body’s natural rhythms. If you’re an adrenal fatigue sufferer who has spent any time researching your own condition, chances are that you’ve encountered some articles or passages in books referring to something known as the cortisol circadian rhythm. By now, you’re probably well aware of the important role that cortisol plays in both your overall health and in your fatigue syndrome. However, the other part of that term – circadian rhythm – may not be as clear. Yet it is an important characteristic of cortisol that you should understand if you are to gain deeper insight into exactly what is going on inside your body during each day. The word “circadian” has its origins in two Latin words: circa, which means “around” and diem, which means “day.” Circadian thus means “around a day” and the rhythm refers to the cycle of physiological and chemical processes that occur over the course of that period of time. Taken together, the cortisol circadian rhythm is a term that describes the ebb and flow of cortisol levels in the body over the course of roughly one twenty-four hour period. The rhythms are actually controlled from the suprachiasmatic nucleus (SCN) that resides in the hypothalamus. This nucleus is responsible for helping every human being to maintain a twenty-four hour sleep/wake cycle, and does so in accordance with various environmental stimuli that help it to remain as close to the twenty-four hour rhythm as possible. Sunlight is one of the key forms of stimuli, but it is also important to remember that many studies have demonstrated that this internal clock will continue to remain on that same basic single-day rhythm even when no external stimuli is available. As a result of our internal clock’s influence, mankind has been programmed since its first days on the planet to rise with the sun and fall asleep under the stars. That cycle remains, for the vast majority of people, the natural sleep/wake cycle that guides their lives. Not coincidentally, that very rhythm is also why most of us are more energetic during the daylight hours, and more lethargic as night falls. It’s built into us at a genetic level. Cortisol has its own rhythm, and it too is closely tied to our sleep/wake pattern. As you might expect, cortisol levels are typically at their highest point right after you first wake up in the morning. This is the natural result of our internal clock processing the light stimuli we receive through the eyes. The suprachiasmatic nucleus sends out a signal that the day has begun, and the adrenals and brain quickly go to work to produce the hormones we need to function throughout the day. Adrenalin begins to pump, as cortisol helps to rouse us from our slumber. Meanwhile, the body also releases serotonin to help with the awakening process. Cortisol levels begin to drop later in the morning, even as adrenalin and serotonin continue to be released. As the morning turns to afternoon, the body’s metabolism increases - along with core body temperature - and we receive those signals that tell us that it is time to eat. The highpoint of that metabolic process occurs around the middle of the day. From that point onward, everything starts to wind down. Cortisol continues to decrease, the metabolism and body temperature fall, and lethargy starts to set in. As the day’s light recedes, our bodies prepare us for rest. Serotonin gets converted into melatonin, which works to induce sleepiness. For both healthy and exhausted patients alike, this is the optimal time to actually end the day and retire to bed. While we are asleep, the body’s blood sugar levels gradually decrease. Sometime after midnight, the body begins to secrete more cortisol as it prepares for the next day of activity. Those cortisol levels continue to increase until you once again wake up to start a new day, repeating the cycle once again. Keep in mind that the cortisol circadian rhythm described above is the same rhythm experienced by virtually every healthy human being on the planet. This is not true for those who suffer from most forms of exhaustion - including adrenal fatigue. The difficulty for most doctors who try to diagnose adrenal issues, however, is easy to understand: though the patterns in the rhythms are different, the differences between the typical levels of cortisol in a healthy and fatigued individual are not so obvious. What is usually seen when cortisol is measured over the course of a day is that normal, healthy individuals have cortisol levels that tend to fall within a certain set range at any given point in that twenty-four hour cycle. The average person will usually have cortisol levels that fall somewhere near the middle of that normal range, between the high and low levels at any given moment. Often times, when doctors measure an adrenal fatigue sufferer’s cortisol levels, those levels will fall within this normal range too. That is one of the reasons that so many doctors have such difficulty providing an accurate diagnosis for their exhausted patients: except in the most severe instances – such as a case of Addison’s disease, most adrenal fatigue sufferers have test results that place them safely within the normal range of cortisol activity. A closer look at the actual up and down pattern of an adrenal patient’s cortisol circadian rhythm over the course of an entire day would, however, clearly demonstrate how abnormal that person’s cortisol rhythm really is. While a healthy person will see his cortisol gently decrease in a steady way throughout the day, someone who is suffering from exhaustion will show a markedly different rhythm. In those individuals, the downward rhythm of cortisol production is more like a rollercoaster as the day wears on. This phenomenon of up-and-down variations in the normal pattern of the cortisol circadian rhythm is known as circadian rhythm Dysregulation. You see, cortisol doesn’t start declining in adrenal fatigue patients after they wake up; rather, it rises significantly. Part of this phenomenon is due to the fact that exhausted individuals start their day at a much lower level of cortisol, and the body races to catch up to where it should be by the time midday arrives. At around noon, most adrenal patients have reached a point where their cortisol levels are actually slightly higher than the normal range for that time of day. From around noon, cortisol levels plummet. Three or four hours later, they approach the bottom level of the normal range and then, rather than continuing to decline in anticipation of the evening rest cycle, they instead begin to increase again. And they continue to increase for another eight hours or more – long past the time when normal cortisol levels would have reached their lowest point in the rhythm cycle. The dysregulation effect described above is not just a minor variation that can be ignored – it is a sign of serious abnormality in the body, and should be addressed without delay. Dietary support should be a primary concern, along with supplements such as methylfolate, Acetylcholine, and various B vitamins to help restore the body’s balance as much as possible. Adrenal supplements like Siberian ginseng can also be critical for restoring adrenal function in these cases. If you still find yourself wondering why any of this matters, just remember one thing: until your body is following that natural circadian rhythm that was built into its design, you’ll never get your fatigue under control. That’s because the very presence of any level of dysregulation will always indicate some sort of problem with your adrenals. The good news, however, is that you can utilize your new understanding of the proper cortisol circadian rhythm as a tool to monitor your progress during your recovery efforts. Simply track how you feel throughout each day, paying special attention to those particular moments when you experience a burst or sharp decline in energy, and record that data as you work to recover. Also note any cravings for sugar, caffeine, or other stimulants that usually occur around the same time energy starts to ebb. As you continue to work through your recovery over several months, you’ll know you’re on the right track when you see that rollercoaster pattern of high and low energy start to smooth out and begin to resemble that gradual decline in energy you should be seeing over the course of each day. For fatigue sufferers, it can be difficult to obtain an accurate diagnosis. One solid test for measuring the performance of adrenal glands involves the use of the Adrenal Stress Index. Cortisol is a hormone, which plays an important part in your body's response to stress. Learn the signs of chronically high cortisol, so you can take steps towards normalizing the levels of this crucial hormone. While elevated cortisol levels remain the focus of most people’s conversation, low cortisol is an equally critical concern. To avoid it, you should know its causes, effects, and symptoms – and then learn how to effectively treat it. The balance between the hormones cortisol and melatonin is critical for normal functioning of the body. Learn what happens when these hormones are disrupted and how you can bring them back into their natural rhythms. Some people seem to have enough sleep, yet they wake up tired and groggy. Why does this happen and what good sleep habits can help you overcome this problem? 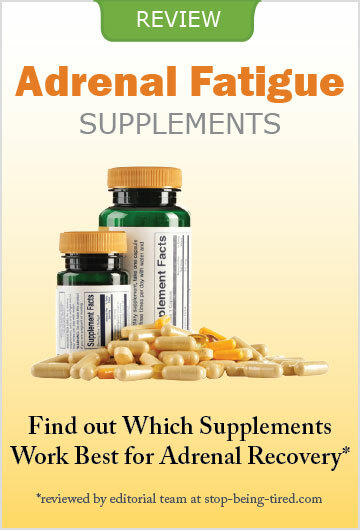 Adrenal Fatigue Supplements - Which One to Buy?